When a system builder has the opportunity to vary their design, a number of factors can come into play. Some want performance, aesthetics, low noise, small form factor, or a long term system. For that last one, ASUS offers the TUF range (The Ultimate Force) of motherboards with 5 year warranties and engineering to warrant it. 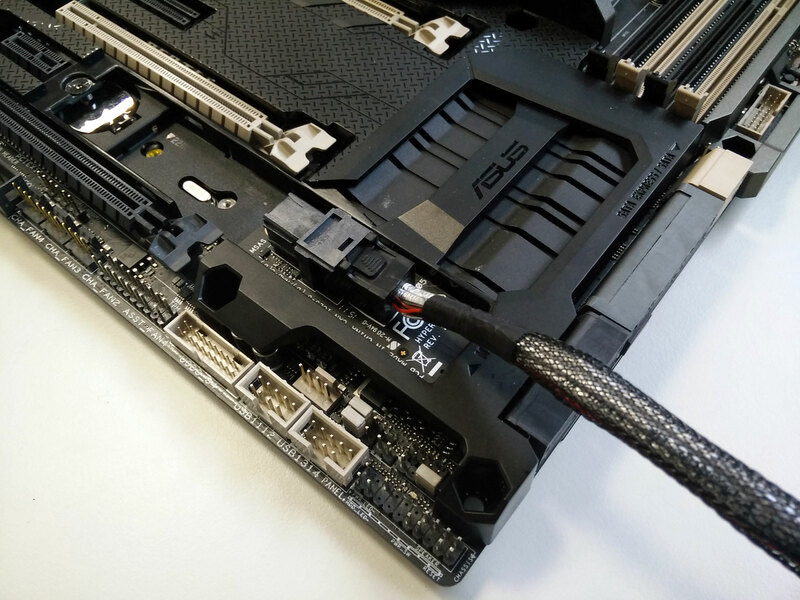 Today we have the latest member of the group aimed at the high end platform for review, the ASUS TUF X99 Sabertooth. An increasing element of recent motherboard design is control. Enthusiasts want access to everything, and the ability to adjust and monitor it all becomes a high priority. This means more temperature sensors, upgraded fan controls, the ability to see what's in the system while in the case, and by extension the ability to run in lower power modes for long periods of time without worrying about the elements or at high power modes at long periods of time also. ASUS first introduced the TUF line back with X58 to answer this question, and we've reviewed several models since. The newest iteration to the concept is the X99 Sabertooth. Straight away, the body armor is hard to miss. This is designed to allow the motherboard to take up to 10kgs of mass without warping, and we recently toured the ASUS HQ to see the armor being twist/torque tested. This is paired with dust guards for all the PCIe slots, onboard headers and ports to avoid the buildup of dust or sand (depending on your location). The armor doubles as an aesthetic cover, with ASUS pursuing a military-esque camouflage design as a subconscious need to a military-grade philosophy (although others might argue it doesn't actually come with military certification). Underneath the cover ASUS claims to use server grade components that are tested to a higher standard beyond that of standard motherboards - this all contributes to the ability to offer a 5 year warranty (in most regions) over the standard 3 year warranty for a motherboard. This is combined with 10 temperature sensors on board and 10/11 fan headers allowing for both DC and PWM control. Users can also add three temperature sensors using the bundled thermocouples for other elements in the system build. Using the bundled software, the fans can be set to dynamically react to the different temperature sensors (or a ratio combo therein) and redirect the airflow to where it is needed. The body armor helps direct airflow around the power delivery as well, with an option small fan for the rear panel. The software interacts directly with ASUS’ ‘TUF’ chip onboard to provide the interaction and control. Aside from the longevity and monitoring aspect of the system, the X99 Sabertooth also has a pair of USB 3.1 ports provided via an ASMedia ASM1142 controller, dual Ethernet (Intel I218-V and Realtek 8111GR), an enhanced Realtek ALC1150 audio codec solution, a single SATA Express port and M.2 PCIe support. It is worth noting that the use of the M.2 slot disables the final PCIe slot. The M.2 slot is also the first recipient of ASUS’ Hyper Kit which allows for conversion from M.2 to U.2 (the new name for SFF-8639), which we test in this review with an Intel SSD 750 drive. Elsewhere on the board, a Thunderbolt header is provided for add-in cards, and a TPM header for enterprise scenarios. 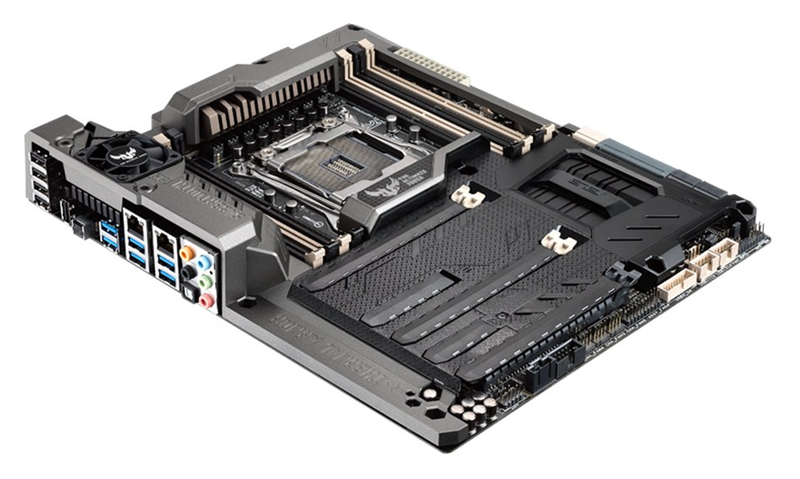 The TUF range of motherboards from ASUS typically doesn’t push the boat in terms of over-the-base functionality, but incorporates a set of measures to aid the lifespan of the system instead. As a result, it is nice to see USB 3.1 and the Hyper Kit support above the normal, alongside the extra fan/temperature control rather than an overclocking focus. It still ends up on the cheap side of X99 as well, coming in at $310. Most motherboards are ultimately sold in pre-built systems of low and mediocre quality, filling in the cheap system hole when businesses need several hundred systems and don’t want to pay a cent more than they have to. As a result, anyone that has had to dig through a computer components bin knows that quality can be low, design can be shoddy and aesthetics are the ultimate afterthought. 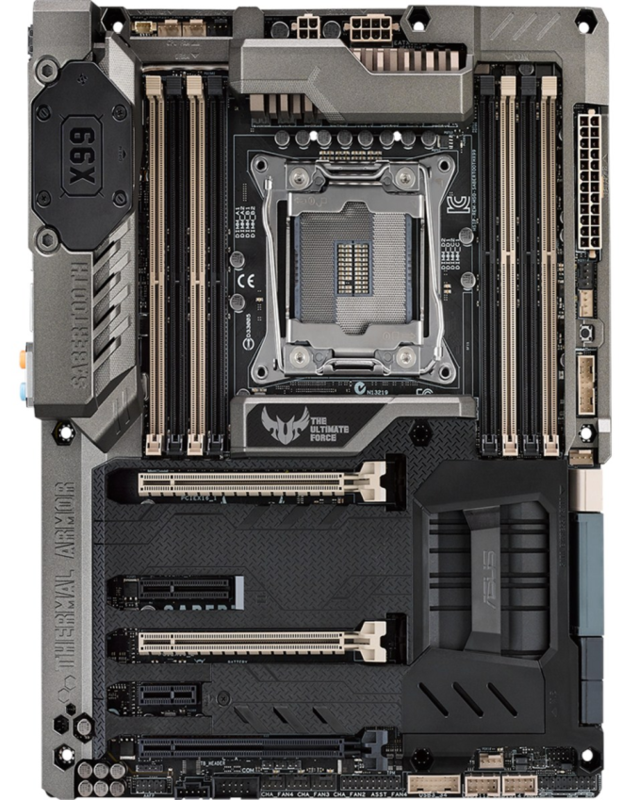 The X99 Sabertooth isn’t likely to change any of this, especially aimed more at the home-build and one-off system designs, but it tackles each of these areas. Taking it out of the box and the first thing to notice is the combined weight and rigidity provided by the Thermal Armor. The Armor is still ultimately a plastic design, but it uses a hard plastic interconnected through the board with metallic elements. A pure steel (or aluminium) design might not be so cost effective and weigh as much as a chassis. But the armor does cover up a lot of the motherboard to avoid dust but it also gives a clean overall look. The bits of the PCB we do see are either clean such as the socket area, or heavily in use such as the bottom of the motherboard. 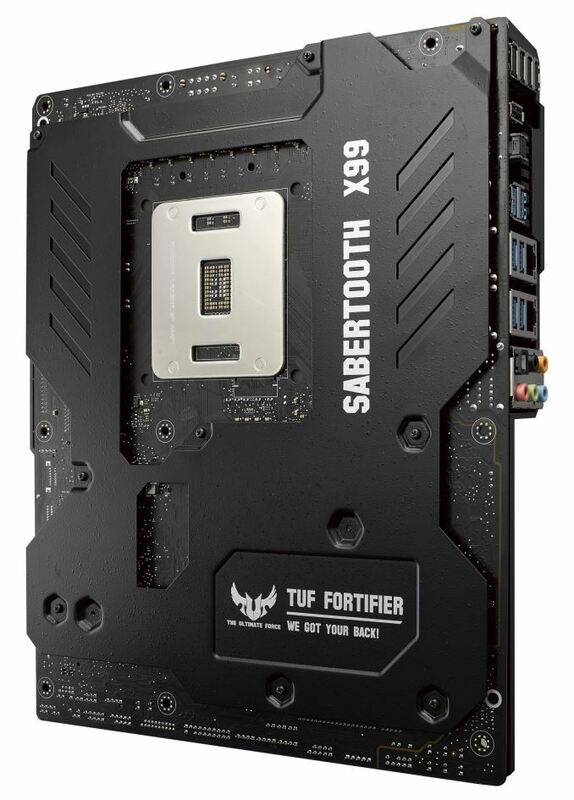 The X99 Sabertooth isn’t designed to be a bastion of overclocking, but the use of the OC socket and upgraded components is designed to help improve frequencies. For fan headers, this board has a total of 10, all 4-pin, with a side fan header as well in the top left. As long as the cables reach, each header should be fully configurable. The Sabertooth comes with sets of PCIe, DRAM and port guards such that when not in use they can be cordoned off and restrict dust/sand entering the ports. On the right hand side we get a USB 3.0 header in-between the fan headers, followed by the SATA ports. The board has 10 SATA ports, six RAID capable and four non-RAID, and despite the image above it only has one SATA Express port. It looks like it has two, but only the top SATA Express extra part works. In order to enable the drive, the appropriate BIOS switch has to be used. In this orientation, the drive can be booted from, but the OS has to be installed via a UEFI install. This means there has to be the appropriate boot profile in the OS, which most modern versions of Windows have (though my Windows 7 SP1 install did not). Because the heatpipe is blocked from its normal area by the connector, the card is not fully in the PCIe slot and does not lock down. 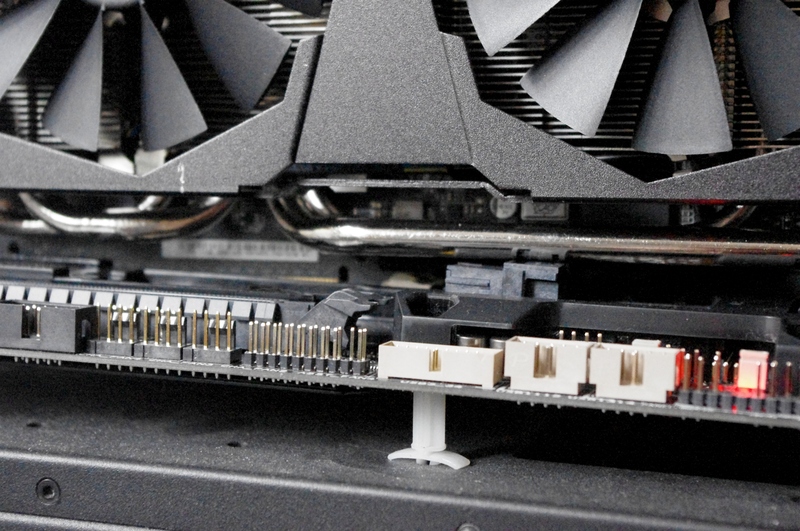 When tested with the card vertical, we didn’t have an issue and all the pins in the slot were connected, although having the card horizontal would mean it should be fixed firmly to the PCIe bracket on the case. 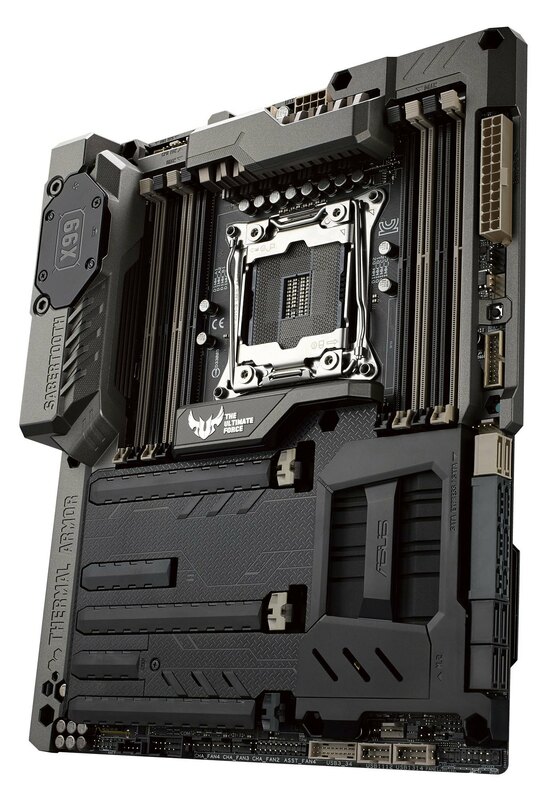 On the bottom of the motherboard we get the front panel audio header, a Thunderbolt header, a COM header, three of the fan headers, a TPM header, another USB 3.0 header, two USB 2.0 headers and the front panel header. Note that sometimes the text on the bottom does not always line up with the port due to lack of space. It is also worth noting on the top of this image is the supplied rear IO fan which is an optional addition included with the motherboard but up to the consumer to manually add. The rear IO panel also has dust protectors included in the box. The rear panel has four USB 2.0 ports, a TUF Detective USB port (connect with a smartphone and use an app to get system information), a USB Flashback/BIOS reset button, two USB 3.1 ports via an ASMedia ASM1142 controller, four USB 3.0 ports via a hub, an Intel I218-V Ethernet port, a Realtek 8111G Ethernet port and audio jacks. There are a number of promotional slides to go along with some of ASUS’ features which are included with the following gallery, such as extra electrostatic protection. Two clear features standout with every TUF motherboard – the number of fan headers and the extended 5-year warranty. "In this orientation, the drive can be booted from, but the OS has to be installed via a UEFI install. This means there has to be the appropriate boot profile in the OS, which most modern versions of Windows have (though my Windows 7 SP1 install did not)." I think you have to install Windows 7 in UEFI or in "traditional" mode, it can't switch back and forth. They probably have some sort of base image they're working off of with all their test tools and that test image goes to MBR/BIOS/whatever it's called mode. Why do so few motherboard manufacturers care about POST times. I'm nearly ready for an upgrade. My PC currently posts then loads windows in ~6 seconds (Windows 8.1, haven't tested it since switching to Win 10). If it blows out to 10 seconds...I guess I could deal with that. Any longer and I am *not* interested. Probably cause no one really cares all that much. Most enthusiasts probably only reboot once a month, if not longer between gaps.